Common Core Grade 2 Practice Tests: New! 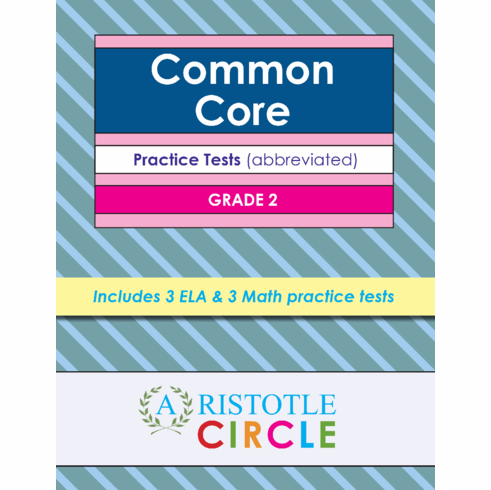 Our Common Core: Grade 2 Practice Tests provide insight into whether a child is performing at, below, or above grade level in accordance with the Common Core state standards. 3 Reading (ELA) and 3 Math practice tests with 195 questions aligned to the new Common Core Standards. Answer keys that identify the exact standards, foundational skills, and topics defined by the Common Core. The Common Core State Standards is a U.S. initiative in education whose main goal is to align curriculum across states from Kindergarten to 12th Grade. In order to assess such curriculum, states must adhere to standardized testing assessments. *Our six abbreviated practice tests should take a total of roughly 3 hours to complete, with each set of tests (1 ELA & 1 Math) taking about 1 hour. The actual Common Core test takes roughly 6 hours to complete over the course of three days. Aristotle Circle has determined which question types will appear with the most frequency on the actual test.